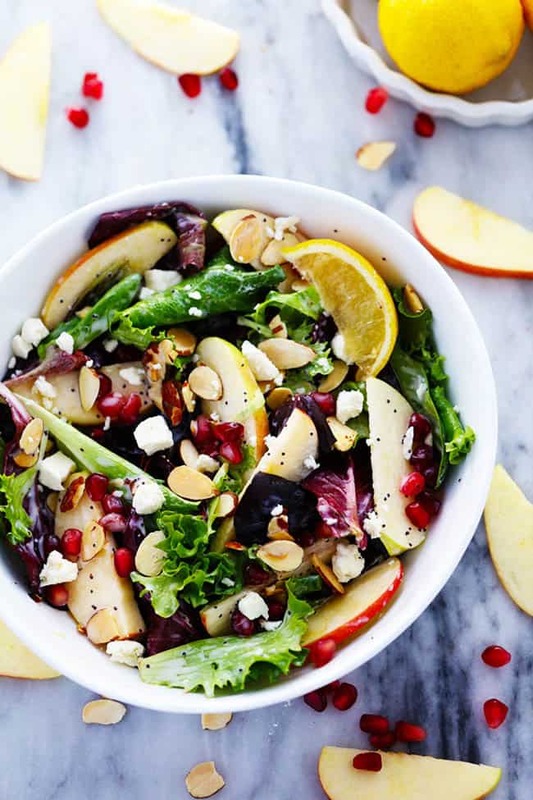 A mouthwatering salad with crisp apples, pomegranate, almonds, feta cheese and fresh spring greens. The Creamy Lemon Poppyseed dressing is TO DIE FOR! You are going to love this salad! So back in the day I hated salad. It was after my first kid that I realized that salads needed to be apart of my life to maintain a healthy lifestyle. So I started wrapping chicken up in lettuce to start getting used to eating that green leafy stuff. Slowly I started liking it more and more. Today I LOVE salad. And it is all about making a delicious salad that will make you crave it even more. Basically my point of that story is… if I can eat salad, so can you! And this is the perfect salad to start with. And if you are already a salad lover, this salad will become your new BFF. This salad combines crisp apples that are crunchy and sweet with every bite. The pomegranate adds that delicious and juicy texture inside along with the crunchy almonds and feta cheese. But let us back the train up for a minute and talk about the real star of the salad. The dressing. Oh my heavens. You are going to become obsessed with the dressing. It is one of my favorite dressings to use with a salad because it is creamy, sweet and delicious! I added a little lemon flavor because lemons remind me of spring for some reason. And spring is just around the corner right? At least I hope so. 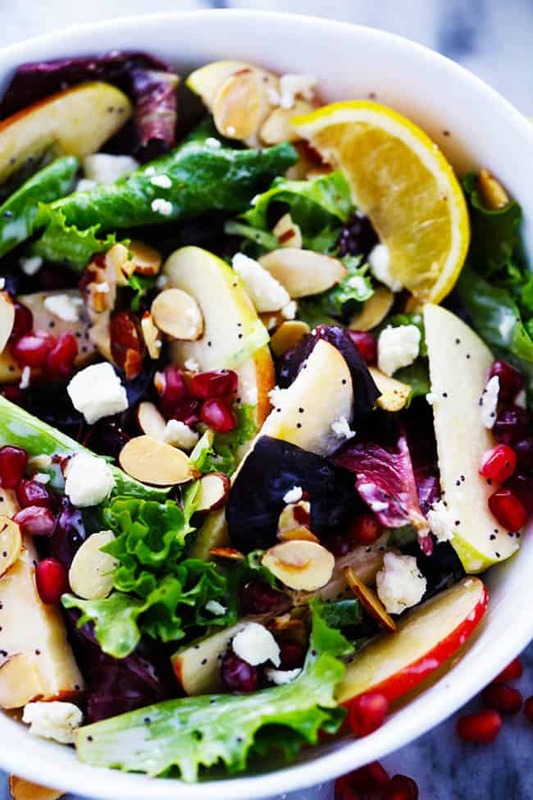 In the meantime, make up this delicious and mouthwatering Apple Pomegranate Salad. With its vibrant colors and delicious flavors and textures, it is sure to be a huge hit! 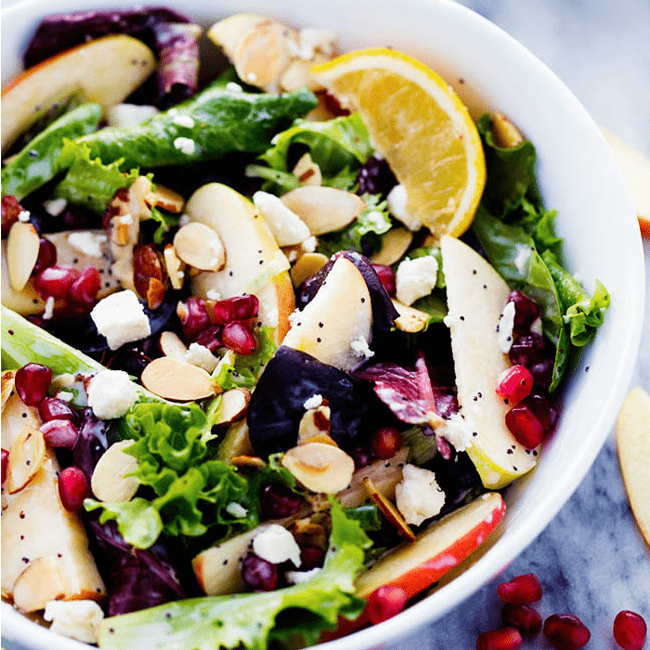 A mouthwatering salad with crisp apples, pomegranate, almonds, feta cheese and crisp spring greens. The Creamy Lemon Poppyseed dressing is TO DIE FOR! You are going to love this salad! 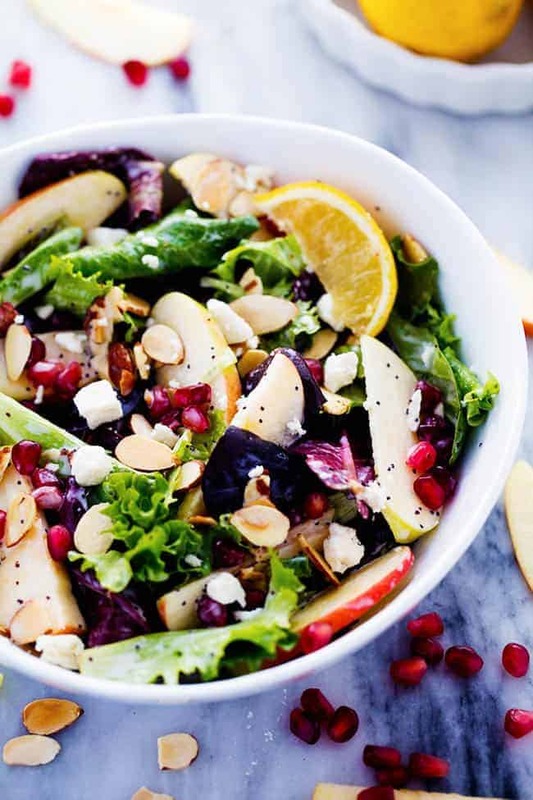 In a large bowl, toss spring greens, almonds, apples, feta cheese, and pomegranate. In a small bowl, whisk together the mayonnaise, milk, sugar, cider vinegar, lemon, and poppyseeds. Pour over the salad and toss to coat. Thank you sooo much for this salad recipe! It was my first time using a fresh pomegranate…it was beautiful as well as delicious! The salad dressing was lovely…so fresh and crisp with just the right amount of sweetness! I did “switch out” the almonds with walnuts that I had on hand. Thanks again for sharing!